Specialist William Alemar will be released today Wed. 8/29/12. The only one "stupid" here is the prosecutor, as Alemar is charged for simple assault to stop the civil rigthts suit against Berkeley Co Prosecutors. It wont work. The prosecutor in the William Alemar case of "you scared the crap out of my constituents.com"
William Alemar went running, possibly intoxicated with all of his equipment for the National Guard in Martinsburg, West Virginia. While this blog network is pretty sure WVA is still in the union, Alemar was charged with a felony act of terror for running with his ORANGE tipped training rifle, or as many are calling it---the Aerosoft air rifle (and yes it has an Orange tip). "He terrified a community that was dropping off their children that day. That's where the charge starts. Now, where we go from here depends on what other information that we have out there - and we have been able to amass a significant amount - but the charge is correct based on what the public was experiencing at that moment," Games-Neely said. If clowns frighten some people, and black cats, will we see Veternary clinics and insane assylums fill up? Pamela Games-Neely has made an oath, similar to the one William Alemar did: to defend the constitution. While Guardsman Alemar was training to do his duty to uphold the constitution, his prosecutor Ms. Games-Neely merely thinks raising your right hand to a Judge or other official is just waving HI. The stuff that may or may have not been on William Alemar's person as he got arrested for terrorism charges in West Virginia. as can be clearly seen from a far distance, and in this photograph, there is an ORANGE tip to this "training rifle" that William Alemar was running with. The fear from soccer mom's should not translate into criminal charges, other than DIP (drunk in public) if Mr. Alemar was in fact publically intoxicated. The Gender bias of the prosecutor Pamela Games-Neely is pretty apparent in this case. As the United States has been at war for over 10 years, and the use of Guard troops in combat a known issue, why then do we have a disconnect and fear in our population from military types preparing for thier job? If fearful women are the cause of police action, and criminal charges, perhaps lets lay off all of the law enforcement in the United States, and give black robes to the moms taking their kids to school. Fear is driving the show here, and it is the responsibility of prosecutor Pamela Games-Neely to stop the circus. Instead of stopping the fear circus, Ms. Neely decided to show her power to the planet. That power went against her oath, and Ms. Pamela Games-Neely will lose the next election. Thats how unconstitutional prosecutors lose their careers. In the next election, the right to equal protection needs to be exercised for Mr. Alemar and removing Ms. Pamela Games-Neely from office. this video shows how to maintain your air rifle. even through you have a orange tip proving its harmless. A community can be terrified of a lot of things. Pamela Games-Neely decided to drop all reason, law, and constitutional rights in West Virginia. Once these things happen our society does not rest on its principles, but we become the Salem Witch Trials all over again. We live in a society of natual laws, and Pamela Games Neely has decided that her own law is more important specific to her gender, ruling on fear. The people of Martinsburg can drive the ultimate fear into Prosecutor Pamela Games-Neely and remove her from her position, because she could not make it in the private sector as an attorney. She doesnt know the law, or whats right. As soon as William Alemar is free, is the beginning of the political end for Pamela Games Neely. Steve Bullock the New York State trained lawyer wants to control everything about hunting and recreating in the State of Montana. His spokesman, Kevin O'Brien told a Butte Montana television station that his candidate is much better suited to change or control the hunt in Montana. This trailer for Legends of the Fall (1994) even looks like Bullock. In Montana, the authorities, answerable to Bullock do what they want through bullying. I've shown this video clip for about a year, and it has almost 75,000 hits since I put it up. Do you think that that amount of people are looking at an 18 year old movie? They are seeing Steve Bullock in action. I know first hand. Steve Bullock threatened my livelihood and house for questioning his Ravalli County Prosecutor George Corn, the ONLY County Attorney Steve Bullock was pictured with in the 2008 race for Attorney General. This has been contained in affidavit TWICE. The recall effort of Steve Bullock was blocked by the same woman who signed my Education license: now Secretary of State Linda McCullough who is the second highest ranking Democrat sellout in Montana, after Governor Brian Schweitzer; who stumped for a Kenyan at the '08 DNC. Steve Bullock used public funds from the Attorney General office to protect a multiple felon. This felon was Angela Wetzsteon who practiced law without a license, and swore she was supervised as required, and was not. 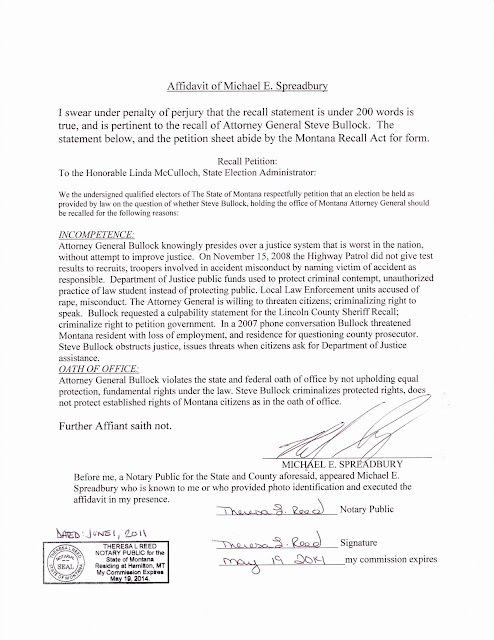 Steve Bullock violated Montana Ethics Rule 5.5 for assisting the unlawful practice of ANYONE. Steve Bullock also took from Montana victims $14 million as public fraud in the Zyprexa lawsuit. A $9.5M 'Mental Health Trust Fund' and $3.5M 'costs' to the Montana Dept. of Justice did not benefit the Montana Elderly victims of Zyprexa who were NOT mentally ill and prescribed the Elli Lilly medicine, got sick with Diabetes, or died﻿. Public Fraud is the #1 criminal priority of the FBI, unless you are in bed with them like Steve Bullock as he assisted their raids in Montana against citizen initiated Montana Law (Medical Marijuana). By contrast, Rick Hill is listening to the voters, and citizens of Montana when it comes to Fish Wildlife and Parks (FWP) in Montana. Apparently there are some real problems coming from all sections of the public in Montana. Rick Hill is making a bold step to stop the corruption within law enforcement in Montana including FWP. One does not have to look much further than Lake Co. when the poaching took place WITHIN the Sheriff Department, and most likely looked the other way by the Montana FWP. Check the Missoula Independent's "Above the Law" article to verify this. The very difference is that Rick Hill gets it. He will listen to the people. When has Steve Bullock listened or helped anyone in the Attorney General office in Montana? Dangerous politicians feel they can threaten people, have power over people, and RULE. Steve Bullock feels entitled to own Montana as Governor in 2012. Rick Hill has demonstrated ability to serve Montana in US Congress, and is demonstrating his ability to listen to win the Governor race in 2012. The abuse in FWP and Law enforcement will continue under Steve Bullock's Montana. Here is a snipet from my living room as I was on probation for speaking in public, care of Steve Bullock's Attorney General office. This clip was translated into 9 languages in 30 days, and has more than 1,000 hits. Do we wonder why Montana tourism has fallen off? Steve Bullock said he wanted to continue the "good work" as Attorney General. Is this it? Kristina Bessenyey MT DOC quickly became an "administrator" after this stunt. no reasonable suspicion to enter, called backup although everything ok over radio. The officer shooting in Hamilton has more than 150,000 hits. The Montana Highway Patrol lost a commander due to failure to investigate a hit and run accident in 2007, and Bullock named Tooley as his successor. Are we better off when the accident scheme (blaming victims of accidents via county attorney, MHP) for State Law enforcement? So for the first time in Montana's political history, and possibly never again can you vote for a Republican (Rick Hill) for progressive change of the Judicial system, while Steve Bullock will use his power and influence over public dollars to float his own agenda. The "polarity" of the parties have changed in the 2012 Montana Governor Race. Rick Hill is wanting to change a few things. Steve Bullock is jazzed that you dont know about his crime spree in Montana, and is pledging to keep his Montana native status, which only means status quo in the Montana Judicial System. So remember that stark video clip in this publication. 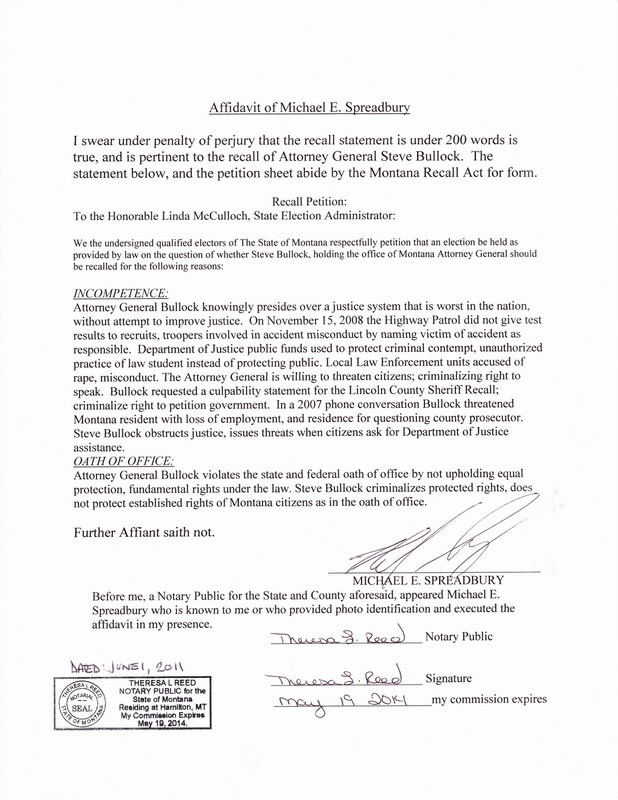 Steve Bullock uses threats and force, (Montana Judicial system) and wants control of YOUR state Montana voters. Rick Hill has already proven his service in Washington DC for Montana. It looks like Rick Hill has made his impression. Its up to you to see for yourself that your family will be better off with a true statesman, who listens to the people. Here is your next Montana Governor. 23,000 people have seen this advertisement. Steve Bullock does not have a video on Youtube with more than 2,000 views as of Oct. 1, 2012. Rick Hill is making a bold move to counter the establishment of Fish Wildlife and Parks (FWP) in Montana. Montana needs a bold guy like Rick Hill to be our Governor in 2012. Can Pam Bucy do it? Can Pam Bucy take an objective view of the Montana Justice System and truly see what it needs? From the campaign and facebook feeds, Pam Bucy has been spoon feeding us that our justice system has been protecting us. I wonder if she really believes this. Pam Bucy comes from the University of Montana Law School in Missoula, MT the ONLY law school in the state, and ranked last bu US news in 2012. Pam Bucy got honors grades there. If she is the ranking assistant attorney General can she be objective and see areas that need improvement? Where has Pam Bucy shown us the vision of their candidacy for Montana Attorney General? She has the token hunting photos, so Joe Six pack might think about voting for her in Montana, but what about the improvements she would like to make? For example, what about the problem with following the Constitution, in any way in Montana? We are not too good for federal dollars, but cant uphold basic rights. 32 seconds that Montana wished never happened. This video has been translated into 9 languages within a month of publication, and over 1,000 views worldwide. All of a sudden, Pam Bucy Yellowstone National Park doesnt look so attractive in Montana. Pam Bucy will the the Chief Law enforcement officer in Montana if elected as Attorney General in 2012. Will she tolerate law enforcement impersonating public officials, AND not caring for law, even when it is right in front of them. Will Pam Bucy make Montana stay just as usual, or will she bring us more justice? All I have heard from Pam Bucy is that we should trust our law enforcement, and our county attorney officers are protecting us. Well, after spending 72 hours in solitary confinement for writing on a public sidewalk with chalk, I guess we get those Federal dollars to neglect fundamental rights, right Pam Bucy?